Mark Twain used to quip, "It is better to keep your mouth shut and appear stupid than to open it and remove all doubt." Bill Clinton however has refused to do so. He has been bragging about his four years of budget surpluses in his new book, "Back to Work: Why We Need Smart Government for a Strong Economy", that also dishes out nostrums for reviving the economy. 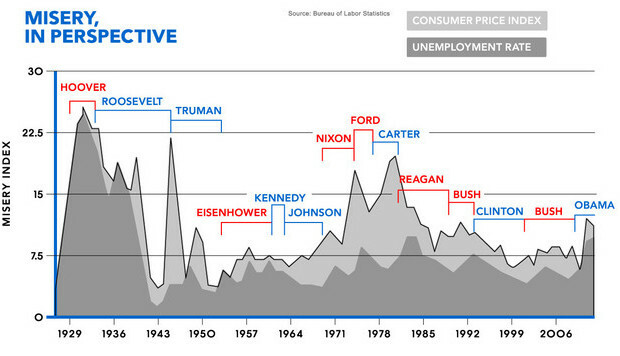 He certainly has credibility based on the US economic performance, as reflected by the decreasing rates of inflation and unemployment, while he was in office (see chart below from Bloomberg). That is true only if you believe that the economy depends solely on the decisions and actions of the President and his administration. But the economy is much more than that. Many variables are in play, all of which are best explained by the 4C framework. We can pick just two of those variables, that is, capacity and communication, to provide the basis for the improving economy under Clinton's watch. And both of them had nothing to do with what Clinton did during his administration. Instead, they were predictable aspects of the fourth Kondratieff Wave. The capacity of that wave can be attributed to the computer, especially the microprocessor. But capacity alone won't unleash investment unless that capacity can be communicated to a wider group of users and producers. The internet, which started to come into widespread use in the 1990s, provides the answer to that missing variable. So Clinton, being lucky enough to be in the right place at the right time, reaped the rewards of the wave's technological progress. As the wave was on the rise, it was natural for business investment to roll along, in a too bullish fashion, eventually ending in the dotcom bust in March, 2000. Consequently prior to the bust, that is, throughout the latter half of the 1990s, the debt of the financial, business and household sectors was briskly expanding (see left chart from The Economist). The period under Clinton's watch is marked red on the chart. The expansion enabled the government to pare down its debt resulting in four years of consecutive budget surpluses. The US government could save because the others borrowed. Yet the total debt was on the rise. Now should Clinton shoulder the blame for not controlling the debt growth? Certainly but looking at the chart, the biggest offenders were Reagan and Bush, Jr.
Another chart, on the left, also from The Economist provides the reason for the continuing credit expansion during the second Bush administration. Under Clinton's watch, the fed funds rate never dropped below 4% except at the beginning of his administration when the economy was still recovering from the 1990-91 recession. Because of the bullish sentiment following the internet technological revolution, credit expansion was not constrained by the relatively high interest rates. The expectation of better economic prospects deluded businesses into investing in ventures that had no hopes of economic returns. After the dotcom bust, the Fed lowered the interest rate in the hope of continuing the economic growth. This time, however, the credit expansion was undertaken by the households who borrowed for capital gains and equity drawdown. Again, without any hope of matching returns from rental income, the situation turned from a housing bubble into a debacle. Clinton's pontification on how to turn around the economy should thus be taken with a pinch of salt. If he doesn't understand the factors that contributed to his budget surpluses, you shouldn't expect him to comprehend the real causes of the current recession. If you really want to get to the root of the current crisis, read up economic history rather than the policy nostrums of a self-deceived ex-president.